Bookmans Phoenix sure is proud of accomplished local artist and Electronics Department guru, Joe Gonzalez. Joe is a longtime Bookmans Phoenix staff member and all around great dude. He has been sharing his visual art with the Downtown Phoenix art scene for the last decade and always makes a point to include Bookmans Phoenix in his rounds. Joe presents live painting sessions and donates artwork for Bookmans pop-culture events. He will be joining us for our upcoming Controllers & Canvas event featuring the awesome Phoenix Gaymers. Extending love of painting, Pokemon and vintage video games to our local community, Joe is one of a kind. We are delighted for the opportunity to work with him! Bookmans Phoenix had a chance to talk a little more with Joe about his work and his presence in the Phoenix community. Joe Gonzalez: Just about 12 years. BP: What is your favorite thing about your work? JG: My favorite part is that it’s always changing and it’s almost like a time stamp of my interests at the time when I look back on past work. BP: We love your pop-culture and video game inspired work! BP: What local businesses have you collaborated with? JG: I’ve worked with Buffalo Exchange, Zia Records, Next Coffee, Novel Ice Cream, Conspire, Green, Alley Art Shows on 5th St. and Roosevelt and Lawn Gnome Publishing. I’ve also live painted at Space 55, Phoenix Educational Programming, and most recently the Mystery Show at Lost Leaf once a month on Thursdays. BP: Wow! That’s an impressive list. How do you balance your art career with your full time gig at the Bookmans Phoenix Electronics counter? Joe is one of the many visual artists in Phoenix who are working to keep culture and magic in our city. Along with muralists like Lalo Cota and Moises, Phoenix is growing a very unique and diverse group of painters. 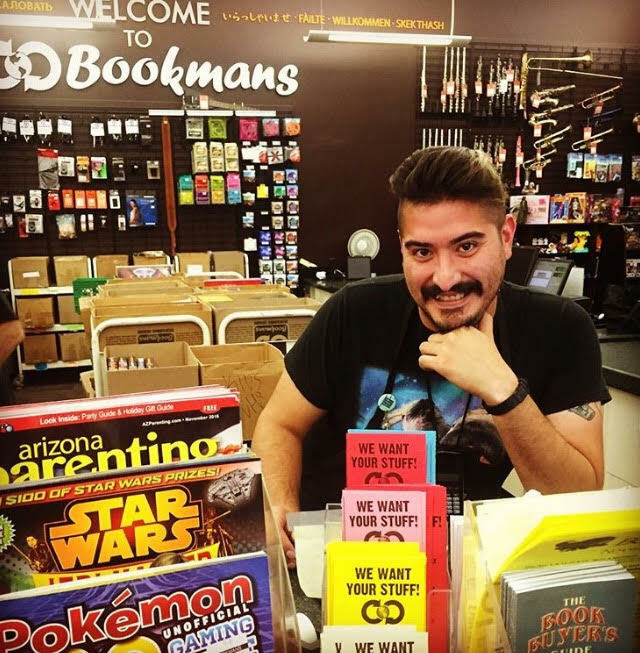 We’re honored to have Joe as a staff member and contributing artist at Bookmans Phoenix!